After seeing the latest generation of digital cameras with cool features like image stabilization and face detection, I finally pulled the trigger and bought myself a new camera, the Sony Cyber-shot DSC-T100, generally available under $399. You may have other criteria, but I was looking for a slim and light take-it-almost-anywhere camera with automatic point-and-shoot modes, plus these new features to try to avoid screwing up quick photos, plus some ability to override and customize in difficult shooting situations. And I was willing to make some other tradeoffs -- the reduced size and weight rule out having an optical viewfinder, so a larger LCD display becomes important, especially for older eyes. And as the design runs out of room for dedicated controls and buttons, I'm willing to rely more on changing settings using the menus on that larger display. The T100 hits my sweet spot -- 8 megapixels of resolution, 5X optical zoom lens, and a nice big 3-inch diagonal LCD, squeezed into a rectangular body that's only 3.6 x 2.3 x 0.9 inches and 6.1 ounces (loaded with battery). This is a nice clean pocketable design -- The front cover slides down to expose the lens, which does not protrude from the camera -- it's all done with optics and mirrors folded into the body. The result is a wonderfully portable device that is quite unobtrusive to use, especially in the available black finish (as compared to the other options of silver and red). It also has some nice features like exposure bracketing (take three quick pictures with +/- exposure), extra close-up Macro mode (closer than 3 1/2 inches), VGA-res movies with optical zoom available, and a variety of modes to help when photographic people, and in difficult low-light situations. Check out the Sony Cyber-shot DSC-T100 digital camera on Amazon.com. Here's the perfect wedding present of consumer electronics fun -- the new RCA Small Wonder model EZ-201 digital video camcorder. It's small and fun and easy and inexpensive -- and white! What more could you ask for as the perfect gift for wedding crashers to have on hand? It's light (around 5 1/4 ounces), small (about the same size as a deck of cards at around 2 1/2 x 4 1/2 x under 1 inch), and easy to buy at around $129. This new EZ-201 model is not a huge update to the previous EZ-105 version -- it has a nicer design, and adds a flip-out LCD panel and a SD memory slot for expandable storage. But the Small Wonder was never about features -- its magic comes from its dead-simple operation, which makes using it so fun. Check the packaging -- there's nothing on the box about confusing camera resolutions and megapixels, no sign of tech-talk specs on megabytes of storage or video and audio compression formats and bit rates, much less long checklists listing competitive features. - Record 30 to 60 minutes of video, direct to the built-in memory (512 MB, but who's counting?). Nothing more is required, though you can add a SD/MMC card for more storage (up to 2 GB). - Save by transferring files to your computer. No cables required -- the Small Wonder has a built-in USB connector that slides out the top from behind a hinged flap. - Share your videos immediately by hooking up the Small Wonder to display on a TV with the AV output jack. Or use the built-in RCA Memory Manger software (which auto-runs on Windows machines) to edit and convert your clips, and also upload them to the Box.net online storage service. So the video literate may complain at first glance about the tiny 1.5 inch display, relatively low-quality video, and lack of true optical zoom -- but the Small Wonder is not about video quality or expertise, it's about making it easy and fun to shoot video. No-sweat video makes great sense if you're a novice, and even for experienced video fans who just want to grab some quick clips. 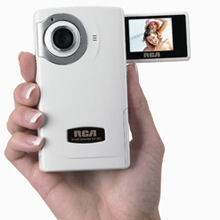 Look up the RCA EZ201 Small Wonder digital video camcorder on Amazon.com. If you've ever found yourself stretching too far for a great shot over a crowd, or getting dirty trying to shoot a hard-to-reach area, then the Quik Pod from Fromm Works can offer you relief, and for under $30. 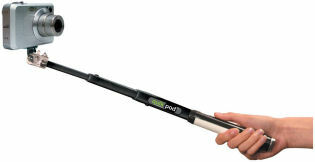 The Quik Pod is light but sturdy telescoping rod that extends out to 18 inches, and then contracts to 7 1/2 inches for storage. Just attach your camera to the standard tripod socket (up to 16 ounces of weight), adjust the angle as desired (up to 90 degrees), and position the camera for the photo. You can shoot photos by setting the self-timer on your camera, or use the Quik Pod to shoot motion video with a wider range of views. Now you can reach where you need to in order to get the shot -- up, down, around, over, and under. And you can avoid asking strangers to take your picture by pointing the camera back towards you for a self-portrait (there's even a tiny mirror to help position yourself in the frame). The Quik Pod weighs around 3 1/2 ounces, and comes with a removable belt clip, hiking clip, and wrist strap -- plus a carry bag, for $24.95. Or step up to the Quik Pod Pro for $29.95, which adds an adjustable tripod adapter that can be screwed into the base of the Quik Pod to turn it into a freestanding pole -- also useful for holding a flash or light source. Fromm Works states that the Quik Pod is manufactured using high quality polycarbonate and aluminum components for strength and portability, and therefore can be used in all weather conditions, even for underwater photography in salt water. A suction cup base accessory and magnetic base for metallic surfaces also are listed to be available soon for $20 each. Look up the Quik Pod extendable handheld tripod on Amazon.com. ARCHOS has just announced its new Generation 5 line of Portable Media Players (PMP), with prices ranging from $170 to $500, for devices featuring 2 to 160 GB of storage. The new line will be available at retail beginning in September. This overview is based on preliminary announcements and brief demos, and therefore is incomplete. The new products look very familiar from the previous Gen 4 players, with the same metallic case design and user interface -- The focus here was on making them thinner and lighter and less expensive -- plus adding interesting upgrades like fun Widget applications and streaming Flash video over WiFi from sites including YouTube. The top of the line, the ARCHOS 705 WiFi and 605 WiFi, have 800 x 480 widescreen displays with touch screen interfaces, and, obviously, the WiFi wireless networking. - The larger ARCHOS 705 WiFi has a 7 inch screen, and comes with an 80 or 160 GB hard drive, and weighs a noticeable 22 oz. The price will range up to $500. - The ARCHOS 605 WiFi is pocket-sized, with a 4.3" screen, weighs 6.7 / 9+ oz., and is available with a 30 GB hard drive for $299 or 160 GB for $339. In a new development, the 605 also comes in a version with flash solid state memory -- 4 GB, plus a SD Card expansion slot, 4.2 oz., for $229. Then ARCHOS is offering two more flash-based players, without WiFi. 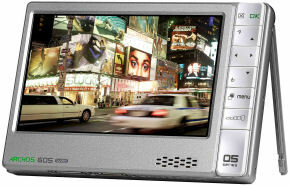 - The ARCHOS 405 is a smaller version of the widescreen players, with 3.5'' 320 x 240 display, 4 GB memory, and SD slot, 4.2 oz. -- a lot for $169. - And the ARCHOS 105 is a different animal -- a mini media player with 1.8'' OLED display, 160 x 128, 2 GB flash memory, and weighing 1.8 oz. It supports a more limited set of formats and features than the other players. Check out the current Archos 704-WiFi on Amazon.com. I'm a long-time user of the Check Point (formerly Zone Labs) ZoneAlarm firewall, so it was the first thing I installed on a new Dell Precision 490 workstation. However, this time ZoneAlarm exploded into a frustrating series of crashes and hangs, which I never really got resolved even after lots of testing with the help of Zone Labs and Dell (gory detail below for fellow sufferers). But out of all this testing came another discovery that was more of a doh! event -- ZoneAlarm adds a huge delay to startup, like 20 to 30 seconds, even on hot new machines. Even on the new multi-core Dell Precision 490, I see a 20 second delay at the Welcome screen. And an older Dimension 8200 desktop (P4 2.53 GHz), spends 22 seconds at the Welcome screen, then another 30 seconds hanging after initially drawing the gray desktop background! But if I disable ZoneAlarm from running at startup, the Welcome screen flashes by in only a second or two. This is particularly odd, because manually launching ZoneAlarm after boot takes more like 6 seconds. There's plenty of discussion of this on the Web and on ZoneAlarm's own forums, but it was helpful to have Check Point officially confirm this to me, saying that a 20 to 30 second delay is typical for firewall / anti-virus applications, and that the benefits of the protection ZoneAlarm provides outweighs the inconvenience of slower boot-up times. RCA has introduced a new RCA Gem line of digital media players -- small portable devices based on flash memory (product information). The RCA Opal is small and light -- just over 1 ounce, with a 1.5 inch color OLED screen, and plays music, and displays photos -- and plays video clips! It uses a built-in (not user swappable) lithium battery, with a rated music playback time of 15 hours. The thin design fits nicely in the hand (1.81 x 3.63 x 0.34 inches), with a Menu button and typical 4-way control to navigate the menus. The Opal connects to a PC through a single multi-purpose earphones/USB/line-in recording jack at the top of the unit. For music, the Opal supports MP3, Windows Media Audio (WMA), WM DRM-10 for purchased music, and Audible for audio books. For photos, it supports JPEG format, with the pre-stored images at 640x480 resolution. And for video, it supports a custom SMV format (around 3.4 MB for a 1 minute clip). And it supports digital voice recording with the built-in mic, as well as line-in recording. However, transferring media is a disjoined process -- you can sync music through Windows Media Player or Yahoo! Music Jukebox, but you drag and drop photos through Windows Explorer, and you must convert videos to the special format using the supplied RCA Video Converter software. 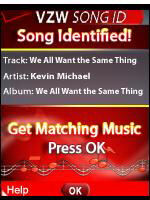 After syncing, the unit works for a while re-building its ID3 tag database to navigate the music. The Opal is available with 2 GB (680 songs) for $75 (model M4002 / blue). 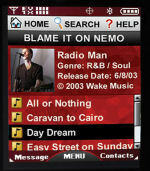 Other models planned are M4001 (red) 1 GB / up to 340 songs, M4004 (black) 4 GB / 1360 songs. Look up the RCA Opal media player on Amazon.com. Dell announced its new consumer systems (and associated marketing campaign) today in a press event at Macy’s Herald Square in New York City. Dell has installed a Dell Lounge at Macy's to demonstrate these products for the next two weeks, as part of its ongoing but still-to-be-fully-disclosed push into augmenting its online business by adding sales through retail stores. Dell also premiered its new consumer marketing campaign, with the slogan "Yours is Here" (www.dell.com/yoursishere), which "promises customers that Dell can deliver personalized devices that enable a great digital experience, virtually anywhere in the world." Key themes in the announcement were personalization through color -- Dell notebooks now come in pink! -- and additional emphasis on addressing its customer support issues. This is also the end of the line for the Dell Dimension brand: the Inspiron brand will now be used for the broad consumer line of desktops and notebooks, much as the XPS brand is already being used for both higher-end consumer desktops and notebooks. I'll review some highlights and trends here, especially the digital media features which are being deployed more widely across the product line, and refer you to the Dell site for more information. The Apple iPod shuffle is the canonical tiny screen-less music player (0.55 oz., 1.07 x 1.62 x 0.41 in. with clip) holding some 240 songs in 1GB, for $79. But if you're more of an Anything But iPod type, you might be interested in a similar device that does not require iTunes, and works with your collection of Windows Media Audio (WMA) music (including purchased music) -- and costs around half the price -- almost an impulse buy. If so, check out the Creative ZEN Stone -- still tiny and light (0.65 oz., 2.1 x 1.4 x 0.5 in. ), same capacity (some 250 songs in 1GB), and for only $39. The Stone is available in six colors (white, red, pink, yellow, blue, black). Playtime is rated as up to 10 hours of continuous play, using a rechargeable (through USB) Li-ion polymer battery. The design is nice and simple, with the typical play controls on the front to skip through tracks and adjust volume, plus a mode switch on the top to switch between normal and shuffle (random) playback. Plus, you can use the mode switch to jump between folders of music, from one album to the next. Entries posted to Manifest Tech Blog in June 2007, listed from oldest to newest.